If you attended the 5th Annual Country Schoolhouse Conference in Barbourville, Kentucky in June of 2005, you probably met Bill Coan and Jack Belcher representing the Howard School Restoration Group, Inc. in Boone County, Indiana. Like the other conference participants, they were there to gather information on restoration, historical research, and methods and materials for living history programs. Their efforts continue, but progress on the old Howard since that conference has been monumental. When landowners Ken Washburn and his sister Kay Seymore challenged Boone Country, Indiana residents to restore and preserve the last available 19th century school building in the county, Coan, Belcher, Elaine Dickerson and Bonnie Kincaid mobilized concerned citizens. They helped form the Howard School Restoration Group to manage the project after Washburn and Seymore offered the one-room brick school and an acre of land to the community members. According to Coan, in a rather complicated series of events, the group's first order of business was to form a charitable corporation and open a bank account for tax exempt donations through the Boone County Community Foundation. Following this, HSRG received grant funds of $1,750 from the Indiana Historic Landmarks Foundation toward a $2,500 feasibility study conducted by a historic preservation architect. The study, completed in December of 2004, estimated that the restoration of the building would significantly exceed $200,000. The roof required complete replacement. Another major expense would be the construction of modern restroom facilities in a separate building that would not detract from the historical nature of the school building. The task of public relations became clear to HSRG founders who immediately began making presentations to civic organizations and manning booths at community events. And the offers of help poured in. Coan said that much has been accomplished far below the estimated cost thanks to the work of volunteers and generous donations of material and labor from individuals and businesses. With all state and county permits and releases in hand and architectural drawings complete, the actual restoration began. With tasks mounting, volunteers rolled up their sleeves. 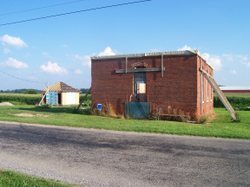 HSRG members obtained bricks from another local one-room school building, constructed about the same time as Howard, but in a condition not permitting restoration. These were donated simply for their removal. Contractor Carl Crane donated the use of his cherry picker for demolition of the Howard School roof and Indy Bobcat donated use of its machinery to clear and dig out the school building*s interior. 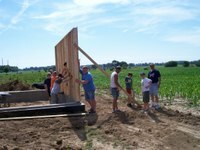 Donation of the use of a backhoe led to the excavation of the restroom foundation. Hamilton Brothers provided a well with good quality water at less than half the estimated cost, while Lebanon Concrete donated all the cement. 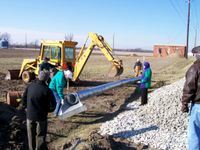 To expedite the building of a parking lot, country commissioners donated a culvert which two of the three commissioners and the HSRG crew installed. The HSRG has purchased all of the roofing and flooring materials for both buildings which they hope to use yet this year. Much of the restroom construction will be completed with the help of Boy Scout Eagle Candidate Tyler Everett, who obtained a $1,200 Youth as Resources Grant for material after he organized friends and family members to help with the building effort. Currently, the restroom building roof joists and rafters, with most sheathing and cedar shake shingles are done. The below ground plumbing is complete, but electrical lines have to be installed.Construction of the roof and the interior will follow masonry and brick work being done on the exterior of the school. As for furnishings and fundraising, students at Western Boone County High School designed and established a web page to promote the project, while furniture, artifacts and school related items were donated by individuals, the Boone County Historical Society and the Zionsville estate of Louis Wiley. To date, over $46,000 in funds and $39,000 in-kind donations have been received including the $1,750 from Indiana Landmarks Foundation, $10,000 from the Central Indiana Community Foundation Efroymson Fund, $1,000 from Brownsburg Wal-Mart, $10,000 from Boone County Community Foundation, $1,500 from Lincoln Banks of Hendricks County Foundation, $2,000 from Boone County REMC, and $500 from Indiana Power and Light. Over $18,400 has been donated by citizens and earned through fundraisers, including two community dinners, and the sale of tee shirts and souvenir coffee mugs. The HSRG owes its success to numerous individuals and organizations, but admits that board members never anticipated the time and effort that would be required for the restoration. They also never anticipated all that volunteers have learned and the high level of personal satisfaction they have felt. The group's plans for the future include: the gathering of historical information on the old Howard School and people connected with it, completion of the application for the National Register of Historic Places, and the implementation of additional grant applications and fundraisers. Donations can be sent to: Community Foundation of Boone County, 60 East Cedar Street, P.O. Box 92, Zionsville, IN 46077 and should be marked for Howard School. Thanks to Bill Coan for information and photos contained in this article. CSAA will update the readership on the Howard School restoration. Photos: Top: The Howard School, condition upon donation; Second left: The Howard School, roof removed; Right: Tyler Everett and crew raise wall of exterior restroom; Bottom left: Boone County Commissioners pitch in to work on installation of cluvert.